Enjoy a delightful evening of Brown County's most talented residents, produced and emcee'd by Kara Barnard as a fundraiser for the BETA Teen Center! The show features a variety of ensembles, solos, and duets with participants ranging from 6 years to 18 years old (plus a few *older* guest artists)!. There will also be a silent auction before the show - proceeds go to benefit the Beta Teen Center! The Brown County Christmas Sing-Along is a home town original show that pulls the audience right into the fun! You and your family can sing along to your favorite tunes... and laugh along with stories from your hosts Kara Barnard, Chuck Wills, and Cari Ray. The Sing-Along is at Brown County Inn and a cash bar is available. All ages are welcome, and kids 6 and under are FREE! Avoid the big box store madness this Black Friday and support local small businesses instead! We will be offering huge savings on a wide variety of our products!!! Come check it out!! 10% off all Banjo and Guitar Instrument Packages! Guitar Packages Include: Your choice of any guitar, Your choice of any gig bag or case, Acoustic Guitar Primer for Beginners Deluxe Edition, Weed Patch's Logo Pick and Art Pick, and a Nylon Guitar Strap. Banjo Packages Include: Your choice of any banjo, Your choice of any gig bag or case, Weed Patch's Bluegrass Banjo Primer, 2 Fingerpicks & 1 Thumbpick, Notecracker Banjo Chord Chart. Free Gig Bag with the purchase of any Savannah A-Style Mandolin! All Diamondhead Colored Ukuleles with Color-Matched Gig Bag only $35.99! Huge Stocking Stuffer Savings! Only $10 gets you 1 Slide Whistle, 1 Kazoo, 1 Harmonica, 1 Nose Flute, & 1 Egg Shaker!!! More deals available in our store! Come and check us out! BENEFIT CONCERT FOR "ON THE ROAD AGAIN"
Join Weed Patch Music Company Co-owner, Kara Barnard, and friends on Sunday, October 1st at the Season's Lodge for this great concert to benefit "On the Road Again". This is sure to be a fun-filled show for a good cause - featuring local celebrities Kara Barnard, Cari Ray, Dionne Ward, Chuck Wills, The Brown County Silver Strings Dulcimer Players, and everyone's favorite beagle - Dobie Jo! On the Road Again is a yearly back-to-school event presented by God’s Grace, the free clothing mission of the Brown County Presbyterian Fellowship. While the event is faith based, it is supported by many of our Brown County churches, and no doctrines or theologies of one particular church are shared with recipients. On the Road Again provides Brown County school children with clothing, personal hygiene items, grooming aids, and other items at no charge, helping each child to feel the comfort, acceptance, and eagerness necessary to successfully return to the classroom. FRIDAY FAMILY NIGHT: MUSIC CLASS! The Weed Patch PeeWee Players are taking the fun on the road! Join Kristin at The Toy Chest - Bloomington for a fun-filled evening of music and movement for your preschool aged children. 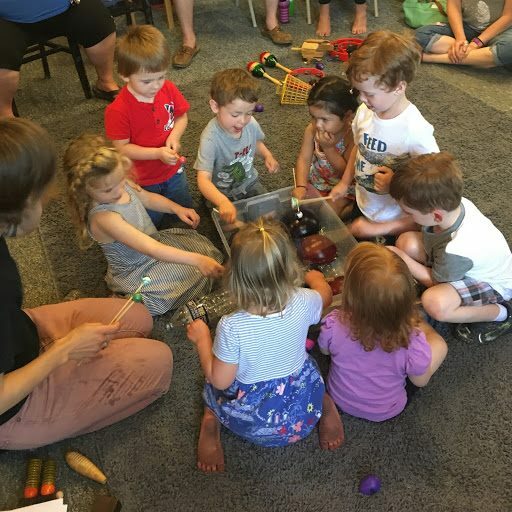 This is a great opportunity to let your little ones get some hands-on fun with a large variety of musical instruments and enjoy a fun evening of singing, dancing, and playing! Weed Patch Music Company's newest class for your tiniest musicians! SESSION 2 OF THE WEED PATCH PEEWEE PLAYERS COMING SOON! The PeeWee Players will operate in a series of 6-class sessions. Each class within the session will be completely unique and involve all new songs and focus on different instruments or playing styles each week. The PeeWee Players Music Program is modeled after the popular Kindermusic and Music Together programs and provides developmentally appropriate music classes for your preschooler to learn basic music skills in an interactive and fun environment. Our classes begin with a hands-on introduction to all of the instruments used in the PeeWee's program and progress through the basics of rhythm and keeping the beat while incorporating singing, dancing, and movement activities to keep your kiddos engaged! Any interested PeeWee's participants are invited to show off their new music skills on stage at the Brown County Youth Music Showcase in March!!! Sign up for a full 6-class session during the month of July for a special super-discounted rate of only $75 total! Prices will increase to our regular rates of $90 for the full 6 class session beginning in August. You may also sign up for an individual class session for $20 per class! Registration is required. Session 2: Coming Soon! - Classes will be held every Thursday for 6 weeks: Dates will be announced as class registrations fill. All classes occur from 5:00pm - 6:00pm. Maximum number of participants is 10, so reserve your spot today! Session 4 "The Showcase Special": Begins Thursday, February 22nd - This special 3 week session will offer even lower prices! This session will focus on preparing our past, current, and future PeeWee Players for a special performance on stage at the Brown County Youth Showcase taking place at the Brown County Playhouse! More information coming soon! SESSION ONE IS NOW MEETING EVERY OTHER THURSDAY! The PeeWee Players will operate in a series of 6-class sessions. Each class within the session will be completely unique and involve all new songs and focus on different instruments or playing styles each week. Any interested kiddos can then show off their skills on stage at the Brown County Youth Music Showcase in March!!! Sign up for a full 6-class session, or drop in at any time! Session 1: Begins Thursday, April 6th - Classes on April 6th, May 4th, May 18th, June 1st, June 15th, June 29th. All classes occur from 5:00pm - 6:00pm. Maximum number of participants is 10, so reserve your spot today! Session 2: Classes will be held every Thursday for 6 weeks. All classes occur from 5:00pm - 6:00pm. dates will be released as class registrations are filled. Maximum number of participants is 10, so reserve your spot today! Join Weed Patch Music Company's own Kristin Thompson at the Brown County Public Library for a free Ukulele Workshop for Beginners! Weed Patch Music Company and The Nashville Spice Company present an in-store concert! Join us for an evening of music, storytelling, and lots of laughs as Dean Phelps teams up with Rick and Holly Garrett of Patchwork for a house concert at the brand new Nashville Spice Company - right next door to Weed Patch Music Company! Suggested Donation for this concert is $10 at the door. Light snacks and beverages will be provided - but please feel free to bring your own! There is very limited seating available, so give us a call at Weed Patch Music Company to reserve your spot today! Come check out the cutest little concert in all of Brown County! The Brown County Youth Music Showcase features young performers from Brown County on a wide variety of different instruments! 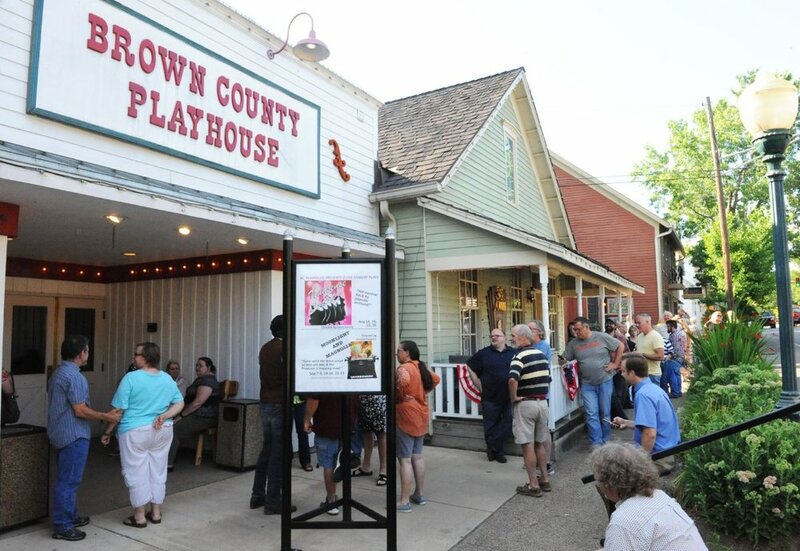 Watch kids of all ages show off their skills on banjo, mandolin, dulcimer, guitar, and more at this concert at the Brown County Playhouse. Hosted by Weed Patch's own Kara Barnard and MC'ed by local musician, Chuck Wills, this event is a real crowd pleaser! Proceeds from the Youth Music Showcase will go to benefit the local BETA Teen Center, a free after-school program for youth in Brown County! Hey Ukulele Fans! Get ready for the first-ever Winter Ukulele Festival! Join ukulele players from across the country for the very first Winter Ukulele Festival here in Brown County presented by Brown County's own Mainland Ukuleles! This event, taking place at the Brown County Inn, will offer discounted room rates for participants and will feature a large jam space, evening concerts, workshops for all ability levels, and more! 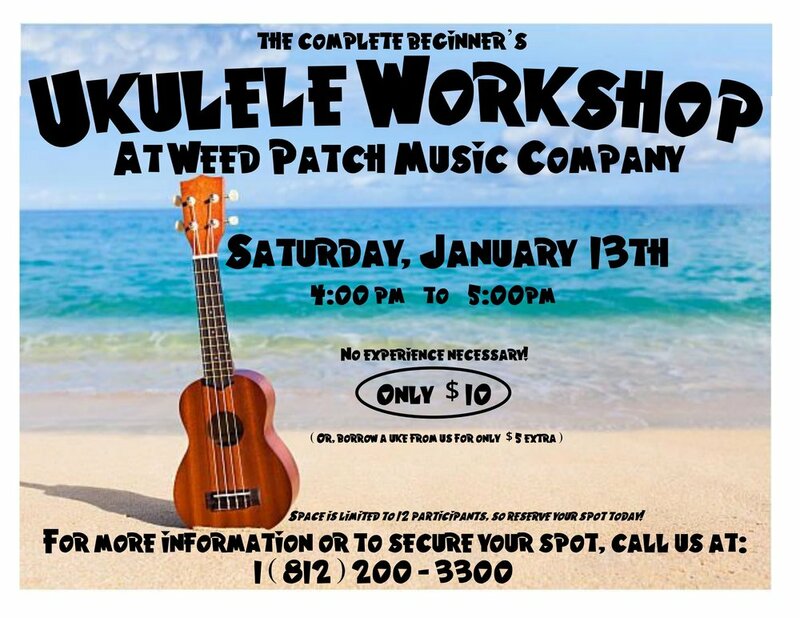 Stop by Weed Patch Music Company for all of your ukulele needs! We carry everything from beginner ukuleles to locally made beauties, and have a wide selection of ukulele accessories, such as books, uke straps, capos, tuners, strings, cases, gig bags, and more! Mike Hater of Mainland Ukuleles - The man behind the Brown County Ukulele Festival. Huge thanks to Mike and Tookta over at Mainland Ukuleles for organizing this great event! Start feeling the festive holiday spirit by joining us for an in-store performance by local violinist, Carolyn Dutton! Join local violinist, Carolyn Dutton, on Saturday December 17th from 2 to 4pm for a special in-store violin performance of holiday tunes! Carolyn will also be available to chat with anyone interested in purchasing a violin or taking violin lessons, which will begin in January 2017 in store at Weed Patch Music Company! Carolyn is an accomplished violinist who performs regularly at local clubs as well as numerous venues throughout the state. She earned a Master's Degree in jazz studies from Indiana University Jacobs School of Music, and for 30 years worked as a professional musician in New York City. She can provide instruction in any medium available to a violinist, and looks forward to meeting with you and explaining how you can realize your dream of playing the fiddle! We'll look forward to seeing you all on Saturday for this lovely in-store performance! Impress all of your family and friends this holiday season with your pickin' skills and all those holiday favorites! Our holiday banjo workshop series is a 3-part workshop for beginner banjo players. Classes will focus on holiday banjo songs for beginners and will utilize all beginner banjo skills. Workshops will last 1 hour each and cost $20/workshop (or $25 to borrow a banjo from the store!). Sign up for all 3 workshops and save money for a total of $50! Space is limited, so contact us to register today! Come check out our great Black Friday Deals! You don't want to miss this! Huge discounts on all items in our store! Get a free gig bag with the purchase of any guitar, banjo, mandolin, or ukulele! Take advantage of our stocking stuffer savings and fill those stockings with musical instruments this year! Huge discounts on T-shirts for Adults and Youth of all sizes! Sale on all Instrument Stands, Music Stands, and more! Have you always been curious about playing the banjo? Well, now's your chance to give it a shot! No prior experience necessary! Bring your own banjo, or borrow one from the store! Our beginning banjo workshop will be a 1.5 to 2 hour long workshop for complete beginners. The cost for this workshop will be $20 per person, or $25 if you would like to borrow a banjo from the store! We will be covering everything from the history of the banjo, to your instrument's set-up, to several different rolls and right-hand techniques to get you pickin' like a pro! At the end of the workshop, we will use the techniques that we learned to introduce some great banjo tunes to practice your newly learned techniques!